Alice Hawte is the daughter of William Hawte and Joan Wydevill. Sir William Fogge lived at ReptonG. N. Septvans is the daughter of William Septvans. 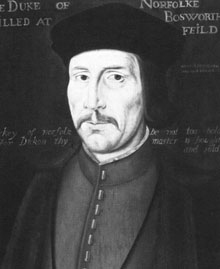 William Septvans lived at Ash, Kent, EnglandG. William Hawte married Joan Wydevill, daughter of Richard Wydevill and Joan Bedlisgate, circa 1429. He was also known as Sir William Haute.1 He lived at Bishopsbourn, Kent, EnglandG. Her married name became Hawte. [S323] Sir James Balfour Paul, The Scots Peerage: founded on Wood's edition of Sir Robert Douglas's The Peerage of Scotland (Edinburgh, Scotland: David Douglas, 1904), volume I, page 56. Hereinafter cited as The Scots Peerage. Admiral Alonzo Henriques was the son of Fadrique Henriques.1 He died circa 1429. He was also known as Senor de Medina del Rio Seco. He gained the rank of Admiral in the Castile. John Howard, 1st Duke of Norfolk was born in 1421/22.3 He was the son of Sir Robert Howard and Lady Margaret de Mowbray.4 He married, firstly, Catherine de Moleyns, daughter of Sir William de Moleyns and Marjery Whalesborough, circa 1443.3 He married, secondly, Margaret Chedworth, daughter of Sir John Chedworth, before 22 January 1467.5,3 He died on 22 August 1485, killed in action. [S6] Cokayne, and others, The Complete Peerage, volume II, page 154. [S6] Cokayne, and others, The Complete Peerage, volume IX, page 612. [S62] Douglas Richardson, Magna Carta Ancestry (Baltimore, Maryland, U.S.A.: Genealogical Publishing Co, 2005), page 313. Hereinafter cited as Magna Carta Ancestry.